Simply by registering, Vecchioli entered into the MerchantCircle network. With his free account, Vecchioli has access to e-mail marketing templates. 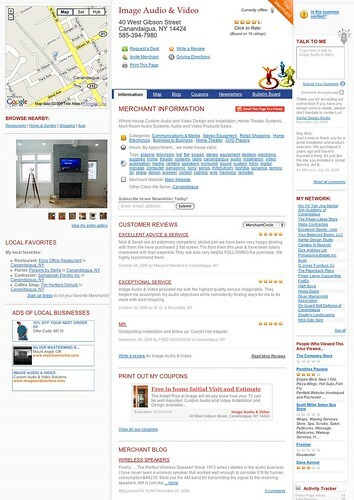 MerchantCircle also gives him access to the profiles of potential business partners. "They offer an e-mail thing, where I can create coupons that I can e-mail to customers," he says. "It's effective. The last time I sent a coupon out, I got three e-mails. They're not big projects, but we do get a response." I spoke to Nick, who says that he recently decided to get rid of his Yellow Pages ad as well. He says the cost for a print and online listing would have tied him in for one year at nearly $160 a month. After seven years of business, he feels comfortable with the fact of dropping his expensive Yellow Pages ad. We think he'll be okay too. Check out his listing below and by clicking here.